Natural Hemp Rope, 3 strand construction. Made from natural hemp or flax, this is a soft rope to handle and reduces the risk of friction burns. Used mainly for school gymnasium climbing ropes, or theatre scenery pulley ropes, but can be used for a variety of tasks where ropes have to be handled. Natural Hemp Rope, 3 strand construction. Made from natural hemp or flax, this is a soft rope to handle and reduces the risk of friction burns. Used mainly for school gymnasium climbing ropes, or theatre scenery pulley ropes, but can be used for a variety of tasks where ropes have to be handled. 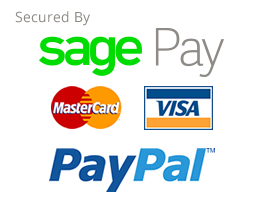 Available by the metre or on 220 metre coils. Natural Hemp Rope - 14mm diameter. Manufactured using natural hemp or flax fibres, Natural Hemp rope is soft to touch and is commonly used for scene pulling ropes in theatres and gymnasium climbing ropes in gymnasiums. Friction burns are reduced due the the soft nature of these ropes. Available to buy in cut lengths as required or save more by purchasing in full length 220m coils. 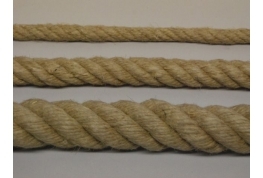 20mm Natural Hemp Rope. 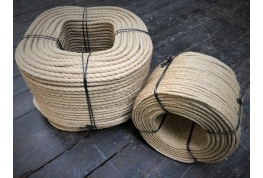 Manufactured from natural hemp or flax fibres, these ropes are soft to the touch and ideal for use in any situation where ropes are to be handled regularly. As a result of the soft nature of the ropes friction burns are reduced. Natural Hemp Rope, 4 strand construction. Made from natural hemp or flax, this is a soft rope to handle and reduces the risk of friction burns. Used mainly for school gymnasium climbing ropes, or theatre scenery pulley ropes, but can be used for a variety of tasks where ropes have to be handled. Available by the metre or on 220 metre coils.